Billed as "the first substantial work on chalk stream fly fishing for many years", this is one of those books that had better deliver and it surely does. What you get is a 200 page volume written by a dozen different members of the Salisbury and District Angling Club and although there is the occasional overlap between their articles, the breadth of the contributors' experience is such that they cover the subject about as well as one could wish. The writers never talk down to the reader and nor do they fall into the trap of pretending that the chalk streams were magically frozen in time a century ago - for example, the taboo subject of the serious decline in hatches is directly addressed - so this book should be a compulsory read for anyone who is thinking of taking a rod on one of these extraordinary little rivers. But surely something gets published about chalk streams every month in the UK? Do we really need anything more in print about them? Well, yes, the magazines do occasionally give the impression that 99% of the fishing in the UK occurs in some impossibly wild heaven hidden somewhere in an England that time forgot, but in practice many of the writers of such pieces are trying to promote either themselves, the fishery, or a miracle fly pattern of their own devising, and very few of them are prepared to get down and dirty over what chalk stream fishing is like in the 21st century. This sort of piece is great when you need a bit of schmalz to cheer you up on a cold winter's night, but less useful when you are scratching your head about what to do with a river full of trout that are obstinately refusing to rise on a dry fly only beat. Graham Chalmer's mob, on the other hand, not only explain why the trout aren't rising, but come up with plenty of ideas about what you might do to rescue the situation. 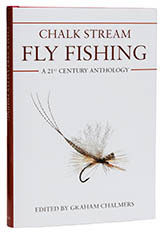 Just about every chalk stream issue is covered, including etiquette, the upstream dry fly rule, nymph fishing and wading, so even if you have never seen a chalk stream in your life, by the time you have finished this book, you will know what to do when you get there. If you are a beginner and considering joining a syndicate, or maybe even just thinking about buying a couple of days somewhere, you really ought to read this. And, as if that wasn't enough, you get a chapter about grayling; another written from the management's point of view (which does a great deal to explain why some of the more archaic rules have persisted); and even a chapter on fly fishing for coarse fish in chalk streams, including minnows. Really. Criticisms? None, really, although if Chalk Stream Fly Fishing gets reprinted, it is such a useful primer, I want it longer, with more about tactics and, though I hate to say it, laid out with wider margins, because it is slightly harder to read than it deserves to be. A great idea, well executed.